The village of Enciso is located in the South of La Rioja, in the Upper Cidacos Valley, 72 kilometres from Logroño, very close to the border with the province of Soria. There are 1,400 dinosaur tracks recorded in the municipality of Enciso. The Palaeontology Centre is the perfect starting point to visit the tracks. There are a total of 7 finds between Enciso and Navalsaz. To access this route, go to the village of Enciso and cross the bridge over the river Cidacos. There you will find signs indicating the routes. You can reach them through a new paved road that connects the towns of Enciso and Cornago, although there is also a cross-country trail. The sites are in the open air, although some are protected by fences and roofs. You can visit them free of charge but you can also hire specialist guides. This is one of the most interesting sites for scientists and there are periodic excavations and site consolidation tasks. Access: From the bridge, follow the trail across road on the right to a shrine, located 400 metres from the village. Interest: It is a find of great interest, with 506 dinosaur tracks. In addition to footprints, there skin marks, tail drag marks and even scratches made by swimming dinosaurs. There are also fossilised tracks showing the start of a fight between a carnivorous dinosaur and a herbivorous one. There are noteworthy marks left by a mud slide caused by a major earthquake as well as ripple marks from waves. If you are patient and spend some time observing attentively, you can discover clearly visible mollusc shells. There are numerous fossilised ripple marks created by waves in shallow sandy areas. Facilities: The site is visited on a wooden boardwalk which protects the stone surface from being damaged. The place has a full-size reproduction of a herbivorous dinosaur and explanatory panels. One of the first that were studied in the region which also enjoys magnificent views. Access: It is located 2.2 kilometres from the Virgen del Campo site, going up the track towards the village of Garranzo. Interest: The outcrop is signposted. It contains 130 tracks, including 10 theropod tracks and 2 ornithopod tracks. It is without a doubt one of the most interesting in La Rioja and also, one of the easiest to understand for an amateur. This is in part thanks to the three-dimensional depictions that have been placed there to allow visitors to get an idea of the real features of dinosaurs. It should also be noted that all models are built based on conclusions of researchers from the remains that you are going to visit. Access: It is located 2 kilometres from the bridge over the river Cidacos. It accessed by the road that goes from Enciso to Cornago. It has a parking lot located at the starting point. Interest: A convenient path allows you to get close to the footprints. The route starts with 4 theropod tracks, clearly marked and well preserved, which are protected by a shed roof and fencing. They are tracks of carnivorous dinosaurs which measured between 7 and 10 metres in length. They were pigeon-toed and their feet ended in powerful claws. In the middle part of the find, a family of iguanodons, consisting of two adults and a baby, left their footprints there. The ensemble is depicted with life-size sculptures. Finally, at the top of the trail, a sauropod which walked on four legs left 59 tracks. Further up, there is a set of numerous tracks, still under study, on which scientists have not provided conclusions yet. Facilities: The site has explanatory panels and 5 life-size reproductions of a tarbosaurus (carnivore), a herbivorous family group (two adults and a baby) and a brachiosaurus (23-metre-long sauropod). 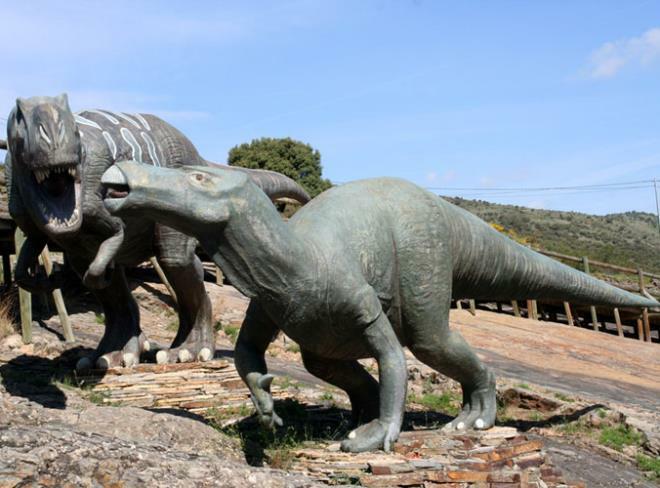 The sculptures were manufactured based on fossil footprints of dinosaurs in Valdecevillo. Access: Located 5 kilometres from Enciso, on the roadside. Interest: The site is covered by a shed roof. It consists of 21 theropod tracks distributed among 4 trails. Three are of carnivorous dinosaurs of great stature, and the other is a small, 75 cm carnivorous dinosaur. Access: Located on the roadside, 5 metres from the Icnitas 3 find. Interest: It contains 84 tracks. It is a very interesting find because it is the site where a new track was discovered for the first time in the world. It was named Theroplantigrada encisensis, in honour of the town of Enciso. The trace consists of 20 tracks of a biped, plantigrade dinosaur, which walked on the whole sole of its feet, and not only the toes, like the majority of dinosaurs. It also had an interdigital webbing, indicating that it was specifically adapted to an aquatic environment. The site has explanatory panels. Access: It is located 8 kilometres from the town of Enciso. Interest: It contains 138 tracks, mostly from ornithopods. Here is one of the biggest iguanodon tracks in La Rioja. A study of the footprints has determined that the leg of the dinosaur was 5.5 metres long. The spectacular size of the tracks allows a full-grown person to comfortably sit in their interior. The site has explanatory panels. Access: After Navalsaz leave the road to walk down the GR-93 trail. Interest: 21 very large ornithopod tracks made by an iguanodon.